Running with SD Mom: Happy Runniversary to me! So yesterday was my grand 1 year Runniversary! I have learned a lot this past year and I will cover that in another post. But the most important lesson I have learned is to listen to your body. I started developing a nagging hip pain after the San Diego Women's Half Marathon (my favorite race so far!) and it wasn't going away. Uphill especially and it wasn't just an excuse to not do hill workouts. So I tried acupuncture and massage. I even tried rest and ice until I gave myself hypothermia! Serious! Alas, I was not to get that magical one step cure all - the CORSTISONE shot! 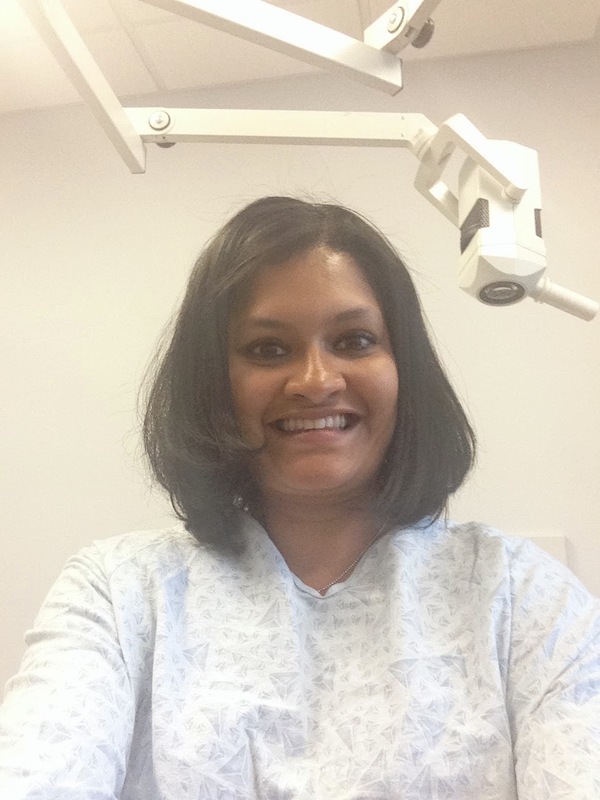 My primary care doctor truly believed I had trochanteric bursitis. 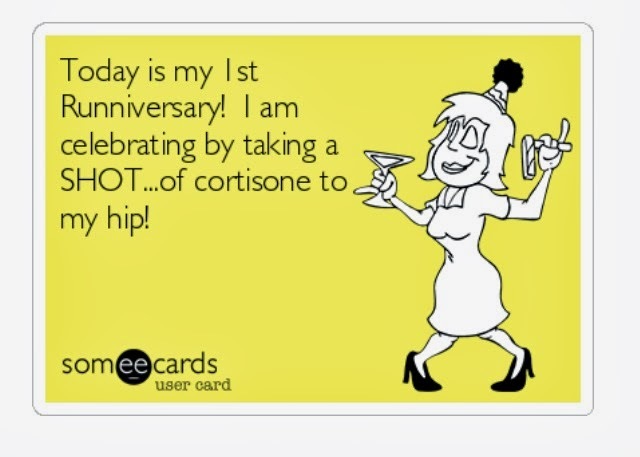 So she referred me out to a sports medicine doctor for a cortisone shot. The doctor took one look at my pain profile and the movements that caused me pain and said, "Left Hip Flexor Tendinosis." I won't go into all of the details but how I understand it is that Bursitis is inflammation and Tendinosis is a pre-tear. And since I am allergic to NSAIDs, I am kind of hosed and my only option is rest, ice and physical therapy. 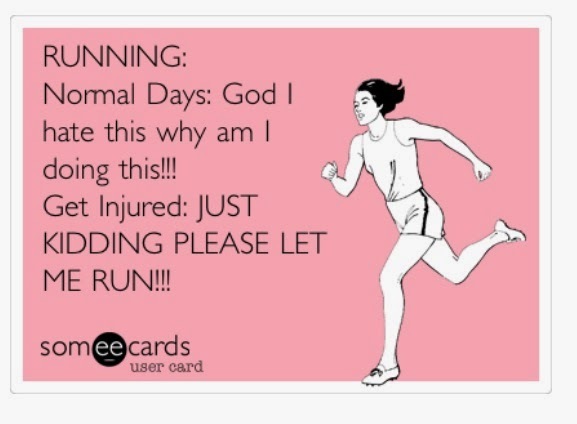 There is nothing worse for a runner than not being able to run! A year ago, I would have said, "A forced break from running? YES!" No more, I don't know where that girl went but she is gone. 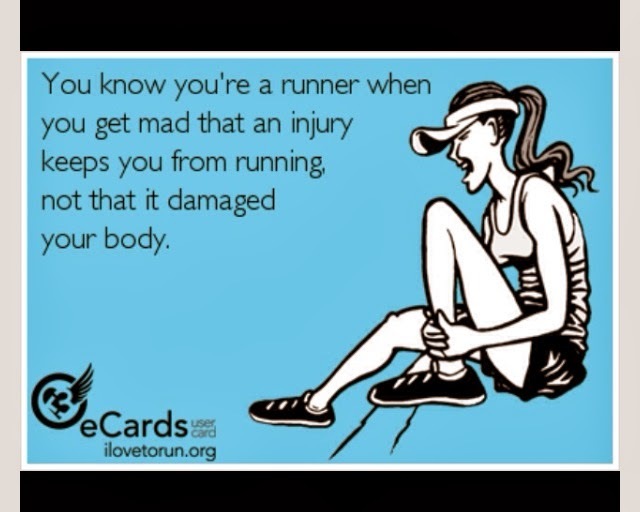 The thought of not being able to run makes me want to curl up into a little ball and cry!